When Mormons or Jehovah’s Witnesses come to your door, they will be prepared with questions that lead you to doubt your faith and see theirs as either reasonable (Jehovah’s Witnesses) or new and better (Mormons). Don’t allow them to lead the conversation. Rather, thank them for coming and tell them you have some questions for them. As they provide answers, be sure to ask them the sources of their answers and then graciously share what you believe the Bible teaches. 1. Where did Jesus come from? Mormons: He began as we all did – as an eternally existing intelligence. Jehovah’s Witnesses: He was the first of God’s creations – created as Michael the Archangel. The Bible: Jesus is the uncreated Creator. He has always existed and is unique with the Father and Holy Spirit as the only eternal beings existing as the Triune Godhead. 2. Is Jesus God, the second Person of the Trinity? Mormons: Yes. However, Joseph Smith taught that the Father, Son and Holy Spirit are three gods. Mormons also teach that their “Trinity” makes up the Godhead for our world only; there are millions of other gods throughout the universe, including millions of potential gods on earth (including you). The Bible: Jesus is the second Person of the Trinity, which may be defined as the one true and living God who exists as three distinct, co-equal, co-eternal Persons. Mormons: To provide salvation for all mankind (meaning resurrection) and to pay for Adam’s sin. Jesus’ death, burial and resurrection made it possible for mankind to be resurrected, but “men will be punished for their own sins” (Article of Faith #2 by Joseph Smith). Jehovah’s Witnesses: Jesus was a “ransom to God for Adam’s sin.” He made it possible for all people to be saved by obedience to Jehovah. He died on a torture stake, not a cross. The Bible: Jesus died on the cross to save us from our sins. On the cross Jesus, who was sinless, became sin for us and bore the penalty of our sins so we can be saved by God’s grace through faith in Him. Jehovah’s Witnesses: Jesus the man ceased to exist at his death. Jehovah recreated his life form into an exalted Michael the Archangel, who returned invisibly to earth in 1914 and is establishing Jehovah’s kingdom on earth, which will come to its fullness at the battle of Armageddon. The Bible: Jesus is seated at the right hand of the Father in heaven. He is seated because the work of redemption was completed in His death, burial and resurrection. He will return one day physically and visibly, resurrect and judge all people. 1. Is the Holy Spirit a Person? Mormons: Yes. According to some, he is a spirit person awaiting “mortal probation” during which he will take on a body. According to others, there is a distinction between the Holy Spirit and the Holy Ghost; the Spirit is a person and the Ghost is a force. Jehovah’s Witnesses: No. The holy spirit is an “invisible act or force” that Jehovah uses to inspire His servants to accomplish His will. The Bible: Yes. He is the third Person of the Trine Godhead and the Bible describes Him with personal characteristics – for example, He may be lied to and grieved. 2. Is the Holy Spirit God? Mormons: Yes. He is the third person of the Mormon concept of the Trinity. Jehovah’s Witnesses: No. The spirit is an impersonal force. The Bible: Yes. He is the third Person of the Triune Godhead. 3. What is the Spirit’s ministry today? Mormons: Some say he is waiting to take on a mortal body. Others describe the spirit as an impersonal force God uses to carry out His purposes. Jehovah’s Witnesses: The spirit is an “invisible act of force” that Jehovah uses to inspire His servants to accomplish His will. The Bible: The Spirit has a ministry to believers and to unbelievers. To believers, He regenerates them, seals them, indwells them, comforts them, convicts them of sins, gives them spiritual gifts, and helps them understand God’s Word. To unbelievers, He convinces them of sin, righteousness and judgment (John 16:7-11). 4. Where did the Holy Spirit come from? Mormons: He always existed. He began as we all did, as an eternally existing intelligence. The Bible: He always existed as the third Person of the Triune Godhead. 1. How may a person receive forgiveness of sins and eternal life? Mormons: Everyone will be resurrected and receive eternal life in one of six places because of Jesus’ death, burial and resurrection. To attain the highest level of heaven, however, a person must pay for his own sins (baptism is for the remission of sins) and be faithful to Mormon teachings. Jehovah’s Witnesses: Requirements for salvation are “exercising faith in Jesus’ ransom sacrifice,” baptism by immersion, active association with the Watchtower society, righteous conduct, and absolute loyalty to Jehovah. The Bible: A person receives forgiveness of sins and eternal life by God’s grace through faith alone in Christ. Jesus’ death, burial and resurrection satisfied God’s justice and extended to all mankind His grace and mercy. No works are required or accepted. 2. Where does a person go at death? Mormons: Some go to Paradise, others to Prison where they hear the Mormon gospel and await others on earth to be baptized on their behalf. Ultimately, all will be resurrected and sent to one of six places, including the highest level of the celestial kingdom (godhood). Jehovah’s Witnesses: 144,000 go to heaven, where they will remain forever. The rest go into a state of soul sleep, where they await resurrection and final judgment. The Bible: The souls/spirits of men and women continue to exist after death. Christians who die go directly into the presence of Christ in heaven and await resurrection when they will receive glorified bodies. Unbelievers who die go to Torment in Hades and await resurrection and final judgment, at which time they will be cast into hell. 3. Will people live forever? Mormons: Yes. Based on their response to Mormon teachings, they will spend eternity in one of six places: 1) outer darkness (reserved for Satan and his demons and the extremely wicked, including apostate Mormons); 2) telestial kingdom (the lowest of the three heavens; the wicked will spend eternity here); 3) terrestrial kingdom (the second of the three heavens; honorable people and “lukewarm” Mormons will live here); and 4-6) celestial kingdom (the highest of the three heavens consisting of three separate levels; the top level is where Mormons hope to be exalted). Jehovah’s Witnesses: Some will and some will not. The 144,000 will live forever in heaven; the “other sheep” will dwell on Paradise Earth; and the wicked will be annihilated after their resurrection and final judgment. The Bible: Yes. All people will spend eternity either in the presence of God (in heaven now and on the new earth after Jesus returns and brings the throne of God to the New Jerusalem) or apart from God in hell. 4. What does it mean to believe? Mormons: To have faith in God and His prophets – particularly Joseph Smith, whom God used to restore true Christianity. Faith requires actions that lead to individual salvation – for example, baptism for the remission of sins. Jehovah’s Witnesses: To “exercise faith,” meaning a combination of belief and works, resulting in the hope of a future life on Paradise Earth (only the 144,000 are in heaven). The Bible: To have faith in God; to trust Him and His promises. It is belief in Jesus alone that leads to forgiveness of sins and eternal life. While good works will naturally follow conversion, good works cannot pay for our sins or merit eternal life. Salvation is God’s gift, provided through the death, burial and resurrection of Christ. This is the final installment in a 10-part series designed to help Christians defend their faith. As the official version of the story goes, in 1820, 14-year-old Joseph Smith, Jr., had a vision in which God the Father and Jesus Christ appeared to him. Caught up in the Protestant revivalism of his day, Smith inquired as to which of the Christian denominations he should join. None of them, he was told, because they were all “wrong and corrupt.” Rather, God would use Smith to reinstate the true church, which had been in apostasy since the death of the apostles. Thus began the saga of the Church of Jesus Christ of Later-day Saints, or Mormons, which today is the largest and fastest-growing cult (form of counterfeit Christianity) in the world, increasing at an average rate of 300,000 converts a year – as many as 75 percent of whom may be former Protestants, according to author Fritz Ridenour (So What’s the Difference: A Look at 20 Worldviews, Faiths and Religions and How They Compare to Christianity, p. 130). The LDS Church initially stood in defiance of historical Christianity, claiming that after the death of the apostles the Christian church fell into “the great apostasy.” Joseph Smith taught that he alone was called to restore the true church and that the revelations God have him – particularly as recorded in the Book of Mormon, Doctrine and Covenants, and Pearl of Great Price – would guide the church back to its historic foundation. In recent years, however, the LDS Church has minimized, refuted or re-interpreted many earlier teachings of its leaders – such as polygamy, the multiple marriages of Jesus, and the curse of African Americans – and has launched a concerted effort to promote Mormonism as mainstream Christianity. This leads some to ask legitimately whether the LDS Church can have it both ways. Either Mormonism is true and all other forms of Christianity are false, or the LDS Church is not really needed, since historic Christianity is true after all, despite Joseph Smith’s claims to the contrary. Mormon leaders are exceptionally vague in their official statements about what the LDS church really believes. A visit to the church’s official Web sites (www.lds.org and www.mormon.org) will frustrate any sincere inquirer who wants to know what Mormons truly believe about the nature and character of God, the Trinity, the atonement, and man’s potential for godhood. Of course, Web surfers can always click on the link for a free Book of Mormon and have Mormon missionaries deliver a copy personally to their door, although the answers these missionaries give likely will be as vague as those provided by their leaders. After Joseph Smith’s initial visit from Heavenly Father and Jesus Christ in 1820, he allegedly saw the angel Moroni appear at his bedside in 1823 and tell him of golden plates on which was inscribed a record of the ancient American people. During his earthly life, Moroni had been a great warrior who lived among the Nephite people, descendents of Jews who fled Israel for North America around 600 B.C. Moroni’s father, Mormon, commander in chief of the Nephites, had given the golden plates to his son, who added a few words of his own before hiding the plates in Hill Cumorah near Palmyra, New York. These plates featured “the fullness of the everlasting gospel.” In 1827, after further visits from Moroni, Smith dug up the plates and began translating the “Reformed Egyptian” with the assistance of two special stones called “Urim” and “Thummim.” The result was the Book of Mormon. By 1830 the book was published and Smith founded the “Church of Christ” (not affiliated with the Church of Christ denomination) with five of his followers. From 1831 to 1844, Smith gained converts and established strongholds in Ohio, Missouri and Illinois. Wherever they went, Mormons attracted curiosity and even hostility, either because non-Mormons did not trust Smith or were suspicious of Mormon beliefs and practices. During this time, Smith claimed to continue receiving revelations. In 1835 he released Doctrine and Covenants, which would become “inspired Scripture” along with the Book of Mormon. By 1838 the Mormons had been driven from Missouri to Illinois, where they converted a swampy area on the banks of the Mississippi River into a thriving community called Nauvoo. It was here that Smith claimed to receive revelations concerning the Godhead, the origin and destiny of the human race, eternal progression, baptism for the dead, polygamy and other unique doctrines. The fourth “standard work” of Mormonism (after the King James Version of the Bible, the Book of Mormon, and Doctrine and Covenants), the Pearl of Great Price, was first compiled and published in 1851 and incorporated into the LDS canon in 1880. Tensions in Nauvoo arose between Mormons and non-Mormons and came to a head when the local paper, the Expositor, published stories exposing the LDS practice of polygamy. Smith, who had risen to power as mayor of Nauvoo and “lieutenant general” of the 4,000-man Nauvoo legion, ordered the paper destroyed. For this, he was arrested and jailed in Carthage, Illinois. While awaiting trial, a mob of 200 attacked the jail and a gunfight ensued. Smith, using a six-shooter that had been smuggled into the jail, killed at least two attackers before he succumbed to gunshot wounds. Following Smith’s death, Brigham Young emerged as successor and led a large number of Mormons west, where they settled in the Valley of the Great Salt Lake in 1847. Today, Salt Lake City is home to the LDS Church. But all LDS members did not follow Young west. Smith’s widow, Emma, stayed behind in Illinois. Those who affirmed her son, Joseph Smith III, as the true successor helped found the “Reorganized Church,” now called the Community of Christ and headquartered in Independence, Missouri. The King James Version of the Bible – “as far as it is translated correctly.” This caveat enables Mormons to question the Bible’s veracity and authority. Joseph Smith made more than 600 “corrections” to its text. According to the Book of Mormon, the Bible is missing “plain and precious parts” (1 Nephi 13:26), which the other three standard volumes complete. Doctrine and Covenants. This volume features 138 revelations given to Mormon prophets, along with two “declarations.” Here, much of Mormon doctrine may be found, including teachings on the priesthood, baptism for the dead, exaltation (or godhood), and polygamy. Pearl of Great Price, which contains Smith’s religious history, the Articles of Faith, the Book of Abraham, and the Book of Moses. “The first difference to grasp between the Mormon Church and biblical Christianity is one of semantics,” writes Fritz Ridenour in So What’s the Difference? “The Mormons use but have redefined many key terms employed by evangelical Christians – a definitive sign of a cult. Analysis of Mormon views, past and present, reveals that they dismiss, twist, change or add to all biblical doctrines, particularly revelation, the Trinity and salvation by grace alone through faith alone” (p. 131). One true church. Joseph Smith declared that all Christian denominations were false and apostate. Mormons teach that after the death of the apostles, all churches became heretical and no true saints existed until the LDS Church was established. Full salvation and “exaltation” (godhood) is found only in the LDS Church. LDS president as living prophet, seer and revelator. Joseph Smith and his successors are considered the sole spokesmen and revelators of God through whom God’s will is made known to the church. These revelations are considered authoritative, although some early revelations have been superseded by more recent ones; others are minimized by the church today; and still others, such as Smith’s prophecy that the temple would be built in Independence, Missouri, in his lifetime, have not been fulfilled. Mormon scripture. Mormons accept “four standard works” – The King James Version of the Bible (“as far as it is translated correctly”); the Book of Mormon; Doctrine and Covenants; and Pearl of Great Price. In addition, LDS presidents may receive new revelations from God, and these become scripture. Jesus is God’s “Son.” Jesus (also called Jehovah) was Elohim’s firstborn spirit child in heaven. (Lucifer also was a spirit child, but his plan of redemption was rejected in favor of Jesus’ superior plan.) Jesus was begotten by God through Mary in a “literal, full and complete sense” (Bruce McConkie, A New Witness for the Articles of Faith, p. 67). Principally in the Garden of Gethsemane (and not on the cross), Jesus atoned for Adam’s sin and guaranteed all people resurrection and immortality (salvation). Jesus visited the Israelites (ancestors of Native Americans) after his resurrection and established the true church among them. We are the spiritual younger brothers and sisters of Christ. Jesus was married at Cana in Galilee (John 2); in fact, He had numerous wives and fathered many children Himself. Humans are gods in embryo. Every person has the potential to become a god by keeping the requirements of Mormonism. A key phrase in Mormonism is, “As man is god once was, as god is man may become.” From a prior spirit existence in heaven, people may be born on earth in order to exercise freedom to choose good or evil and to have a body for the resurrection. By obeying Mormon teachings and performing required duties, worthy Mormon males may pass the celestial guards, bring their wives with them, and achieve a status similar to Elohim. In the resurrection, faithful Mormons receive exaltation (godhood) and will have authority over their own world. Salvation by works. When Mormons say people are “saved” by grace through faith, they mean “resurrection.” In this sense, virtually all people will be saved. To achieve the highest tier of the highest level of heaven, Mormons must exercise faith in the god of Mormonism, in Christ, and in the Church of Jesus Christ of Latter-day Saints; exercise repentance; and be baptized in the LDS Church. Additionally, they must keep the “Word of Wisdom” by abstaining from alcohol, tobacco, and caffeine; tithe to the church; attend weekly meetings; support the Mormon prophet; do temple works; and be active in their support of the church. “Full salvation” or “exaltation” (godhood) is only available through the LDS Church. Eternal progression. All people, as well as all gods, have existed eternally. There are four stages in “eternal progression” through which people may pass: 1) eternally existing intelligence; 2) pre-mortal spirit; 3) mortal probation; 4) resurrection and eternal life in one of six places: outer darkness; the telestial kingdom (lowest level of heaven); the terrestrial kingdom (next-highest level of heaven); or the celestial kingdom, consisting of three levels, the highest of which is exaltation/godhood. Some 50 years after Joseph Smith claimed to be visited by God the Father and Jesus Christ, an event that launched the Mormon Church, another teenage boy began an inconspicuous Bible study in Allegheny, Pennsylvania, in 1870. The result was the establishment of a second major cult (counterfeit form of Christianity) in the 19th century, known today as the Jehovah’s Witnesses. Officially known by several names — The Watchtower Bible and Tract Society of New York, Inc., The Watch Tower Bible and Tract Society of Pennsylvania, and the International Bible Students Association – the Jehovah’s Witnesses today boast more than 6.6 million active participants (known as “publishers”) in more than 230 countries, with nearly 100,000 Kingdom Halls, one of the largest publishing operations in the world, and an aggressive door-to-door “preaching” ministry. It all began with Charles Taze Russell (1852-1916). As a teenager he rejected many of the views taught in his Congregational church, particularly the doctrines of hell and the Trinity, which he found unreasonable. Influenced by Adventists, who assured him there is no eternal punishment and who focused on the return of Christ, he formed his own Bible study and began to develop his unique theology. In 1879, Russell began publishing his own magazine, eventually known as The Watchtower, predicting that the battle of Armageddon would take place in 1914, at which time Jehovah would destroy all earthly governments, end the “Gentile times” and establish His kingdom on earth. Russell believed and taught that Jesus had returned to earth invisibly in 1874. 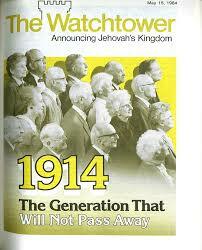 By 1896 Russell had founded the Watchtower Bible and Tract Society. In 1908 he moved his headquarters from Pennsylvania to Brooklyn, New York, where it remains today, along with a massive printing operation, an apartment building, offices, and a Bible school. When the First World War began in 1914, Russell claimed his prophecy of Armageddon was on the verge of being fulfilled, but he died a failed prophet two years later. Joseph F. Rutherford, legal advisor to Russell’s organization, became its new president in 1917. He set a new date of 1925 for Armageddon, but when it didn’t happen, the charismatic and domineering Rutherford backed away from his prediction, claiming that his followers misunderstood him. Undaunted, he changed the name of the society to the Jehovah’s Witnesses, taken from Isaiah 43:10, in part to distance his followers from splinter groups forged by former disillusioned members. He also escalated the aggressive door-to-door “preaching” that distinguishes Jehovah’s Witnesses today. In fact, Jehovah’s Witnesses log more than 1.2 billion hours of “preaching” door-to-door each year. In an effort to rapidly increase membership, Rutherford proclaimed that only 144,000 people would make it to heaven. When Watchtower ranks swelled beyond this number, Rutherford announced that everyone who had become a Witness before 1935 would go to heaven (the “little flock”), while everyone who joined after 1935 would be among the “great crowd” who would not go to heaven but could live in an earthly paradise after Armageddon and the Millennium. Rutherford died in 1942. His successor, Nathan Knorr, was less flamboyant than Rutherford and changed Watchtower policy so that all publications from that point forward were released anonymously. Under his direction, the society issued a new Armageddon dating system, teaching that Jesus had not returned invisibly in 1874, as Russell had taught, but in 1914. Further, the generation that had been alive in 1914 would not “pass away” (see Matt. 24:34) before Armageddon would occur – an “absolutely final” date of 1975. Knorr died in 1977 with the final battle yet to be waged. Frederick Franz became the next president. While he would not permit the society to set any more dates for Armageddon, he insisted that persons alive in 1914 would witness this cataclysmic event. He died in 1992 at age 99. Successor Milton G. Henschel discarded the entire end-times scenario in favor of “new light” that made the “generation” of Matt. 24:34 apply to any generation that sees the signs of Christ’s return. Don Adams heads the organization today – a society that remains prolific in its publications and aggressive in its evangelism. The Watchtower, a semimonthly magazine that instructs the society’s members in faith and practice, is published in 158 languages with a circulation of more than 21 million. Awake!, designed for non-members, reaches 18 million readers in 81 languages. The society’s official Web site may be found at www.watchtower.org. Jehovah’s Witnesses acknowledge that Charles Taze Russell was “the prime mover of the group” (official Web site) but seek to distance themselves from him and his teachings. Unfortunately, Jehovah’s Witnesses today still cling to Russell’s main false teachings: a denial of the Trinity; a denial of the deity of Christ and His bodily resurrection; a denial of the Holy Spirit’s deity and personality; a denial of hell as a place of everlasting punishment; and more. God’s name is Jehovah; He is not triune. No other names must be used to depict the one true and living God. Jehovah is a “spirit being,” invisible and eternal, but He has a spiritual body and is not omnipresent (Insight, vol. 1, pp. 969-970). Neither Jesus nor the Holy Spirit is God; the Trinity is strenuously denied. Jesus is Jehovah’s first created being. Jesus had three periods of existence. In His pre-human existence he was called “God’s only begotten Son” because Jehovah created him directly. He then used Jesus to create all other things. He also had the personal name Michael the Archangel. The second stage of Jesus’ life was on earth as Jehovah transferred his life from heaven to the womb of Mary. Jehovah’s Witnesses are adamant that this was not an incarnation. Jesus became Messiah at his baptism, was executed on a torture stake, and his humanity was annihilated. He then began the third stage of his life, being raised an immortal spirit who returned to heaven once again as Michael the Archangel. He returned invisibly to earth and “very soon now, he will manifest his rulership over our troubled earth” (Knowledge, p. 41). Jesus is not God. Jehovah’s Witnesses teach a type of polytheism with a doctrine of two gods. The say Jehovah is the Almighty God who created Jesus, and Jesus is the mighty god who created everything else. This is simply a modern version of an ancient heresy. Arius, a pastor’s assistant in Alexandria, Egypt, taught that Christ was a created being. He captured a strong following, which necessitated the Council of Nicea in A.D. 325. Jesus rose spiritually, not physically, from the dead. Jehovah’s Witnesses claim that Christ was raised from the dead as a spirit who only appeared to have a body. What the disciples saw after Christ’s death was Jesus’ “re-created body.” Because in Watchtower reasoning the body and soul of an individual become extinct at death, God must re-create the “life pattern” of a person, and He does so by retrieving the life pattern from His memory. The Holy Spirit is not God. Jehovah’s Witnesses teach that the “holy spirit” is an “invisible act or force” that Jehovah uses to inspire His servants to accomplish His will. Put simply, the holy spirit is like electricity, according to Watchtower reasoning. Christ’s death did not provide full atonement. Jehovah’s Witnesses teach that Jesus was a “ransom to God for Adam’s sin.” By this, they mean that Jesus (Michael the Archangel in human form) was a fair exchange for Adam’s sin. As such, he made it possible for all people to be saved by obedience to Jehovah. Christ died on a torture stake, not a cross. After lying in death for parts of three days, Jehovah re-created him as a mighty spirit person. Salvation is by faith and obedience. Requirements for salvation are “exercising faith in Jesus’ ransom sacrifice,” baptism by immersion, active association with the Watchtower society, righteous conduct, and absolute loyalty to Jehovah. There is no assurance of salvation, only hope for a resurrection. There are two classes of saved people. Only 144,000, known as the “Anointed Class,” will go to heaven at death to rule with Jesus. Most Jehovah’s Witnesses hope to be among the “other sheep” or “great crowd” who will not go to heaven but live forever in Paradise on earth after Armageddon and the Millennium. Hell is mankind’s common grave. The body and soul cease to exist at death, say Jehovah’s Witnesses. When Jehovah raises them from the dead one day, the righteous will populate Paradise on earth (the 144,000 “Anointed Class” are the only people in heaven). Apparently, the wicked will have a second chance for life, but if they don’t measure up, they will be annihilated, ceasing to exist forever. Jehovah’s Witnesses deny the biblical teaching that hell is a place of conscious, everlasting separation from God. JW False Doctrine 4: Christ’s atonement denied. Jesus had to “earn” immortality: “Christ Jesus was first to receive immortality as a reward for his faithful course on earth….” (Let God be True, p. 74). “Finishing his earthly course free from flaw in any sense of the word, Jesus was acknowledged by God as justified. He was thus the only man who, through test, stood firmly and positively just, or righteous before God on his own merit…. Jesus Christ, after his faithful course until death was ‘made alive in the spirit,’ given immortality and incorruption” (Aid to Bible Understanding, p. 431). JW’s teach that Jesus, fully human but in no way divine, died on a Roman torture stake to exonerate the name of Jehovah and to give mankind an opportunity to earn a place in Paradise Earth. At death, Jesus the man ceased to exist, and three days later Jehovah recreated Jesus as Michael the archangel. “Jesus died as a “ransom sacrifice” to buy back what Adam lost: the right to perfect life on earth” (10 Questions & Answers on Jehovah’s Witnesses, p. 7). Christ’s death at Calvary paid our sin debt and purchased our salvation so that everlasting life is received by grace through faith in the Person and work of Jesus (John 3:16; 5:24; Rom. 4:4-5; 1 Cor. 15:1-4; Eph. 2:8-9; Titus 3:5). JW False Doctrine 5: Christ’s bodily resurrection denied. JW’s teach that at death, Jesus the man ceased to exist, and three days later Jehovah recreated Jesus as Michael the archangel. JW’s must deny Jesus’ bodily resurrection to justify their belief that He returned invisibly in 1914 and is working behind the scenes to prepare the world for Armageddon and the institution of His millennial reign. JW’s teach that Jesus was created as Michael the archangel, then recreated as Jesus the man, then recreated as Michael the archangel. Russell stated, “The man Jesus is dead, forever dead” (Studies in the Scriptures, Vol. 5, p. 454). The body of Jesus, whether, as they claim, it was dissolved into gases or preserved as a future memorial, was not what was raised from the dead (The Truth Shall Make You Free, p. 264). “At death, Jesus’ human body was ‘disposed’ of by God’s power, and Michael rose from the dead as the ‘resurrected Jesus Christ.’ Since angels are invisible, Jesus fabricated physical bodies resembling His original body to convince His disciples that He had rise from the dead. Since 1914, when Jesus’ ‘invisible presence’ on earth began, He has been reigning from heaven, awaiting the future battle of Armageddon in which He will rid the earth of human governments and set up ‘Paradise’ under ‘Jehovah’s Kingdom government arrangement'” (10 Questions & Answers on Jehovah’s Witnesses, p. 4). Jesus rose physically from the dead (Matt. 12:38-40; 28:5-10; Rom. 1:4; 1 Cor. 15:4-8; 1 Peter 1:18-21). JW False Doctrine 6: Christ’s physical return one day denied. “Since 1914, when Jesus’ ‘invisible presence’ on earth began, He has been reigning from heaven, awaiting the future battle of Armageddon in which He will rid the earth of human governments dn set up ‘Paradise’ under ‘Jehovah’s Kingdom government arrangement'” (10 Questions & Answers on Jehovah’s Witnesses, p. 4). Jesus is coming back physically and visibly one day (Matt. 24:29-31; John 14:3; Titus 2:13; Rev. 19:11-14). Next: False doctrines 7-10 of the Jehovah’s Witnesses.